This block is used for supporting a single cable up to 2-3/4 in. (70 mm) in diameter on 1/4 - 3/8 in. (6-10 mm) bare strand prior to the lashing process. 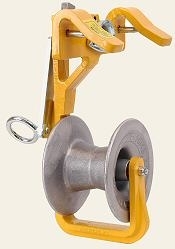 The sheave contains oilite bearings for a smooth pulling operation and a long lasting life span. Contains steel inserts on the underside of each strand hook for smoother pulling and less wear. Lever actuated bi-directional cam locks the frame on the strand to prevent travel while pulling in cable. Cam automatically releases the block when pushed by the lasher from the other direction. Contains an eye hook that allows you to lift the unit and lock it into place from the ground. (See D Cable Block Lifter) These units are normally placed anywhere from 15 ft. to 25 ft. apart on the strand depending on the cable weight and pulling conditions. 300 lbs. (136 kg.f) load capacity rating. D Cable Block Lifter is specially made for putting D Cable Blocks onto suspension strand. Make block placement from the ground fast and easy. A cradle supports the block while a hook operates the block cam lever. Used for hanging cable blocks at the pole as temporary support for cable or wire. Can be mounted on "J" brackets or suspension/extension bolts.